My work portrays travel and the city as a metaphor for creating fictional landscapes. My work has literary and cinematic influences from which I build scenes. I constantly draw and redraw characters as a part of my creative process to conceive my images in which I use the visual and expressive qualities of painting and printmaking techniques and mediums.The images that I invent include urban environments, and elements of everyday life such as automobiles and characters who wander paths of uncertainty. Gustavo Mora was born and raised in Mexico. He studied Studio Arts at the Institute of Visual Arts of Puebla, Mexico. He has been working on drawing, painting and printmaking. He has participated in exhibits and art events in Mexico, Argentina, Cuba, Costa Rica, France, the United States and Japan among others. His solo exhibits include Gustavo Mora Printmaker at Mission Cultural Center in San Francisco, CA, and Landscapes at the San Francisco Friends School gallery in San Francisco, CA. He has also participated in collective exhibits such as José Guadalupe Posada at Monterrey Museum, Mexico, the 6th Kyoto International Woodprint Association in Kyoto, Japan, the XIV International Biennial of Engraving and New Images in Sarcelles, France, and the National Contest of José Guadalupe Posada Engraving at the Posada Museum in Aguascalientes, Mexico. In 2009, he won honorary mention in the First Biennial of Mexican Contemporary Print at the National Museum of the Stamp in Mexico City. 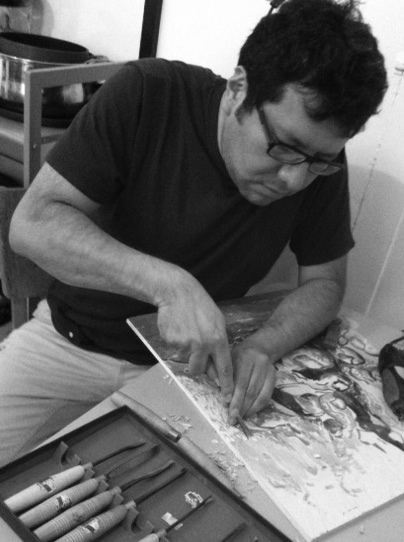 He is the founder director of Casa Roja Workshop, Mexico since 1998, and he has been member of the California Society of Printmakers since 2008.